CBERS-4 is part of the China-Brazil Earth Resources Satellite cooperation that finds its roots in 1984 in an agreement between Brazil and China to share technology in the development of Earth observation satellites for use by both sides for a number of civilian purposes. The program saw its first launch in on October 14, 1999 when the first CBERS satellite was delivered to orbit. CBERS 1 carried a suite of three remote sensing instruments to observe the Earth in different wavelengths to serve a number of purposes including environmental monitoring, resource assessments, urban planning, and natural disaster response and relief. The first satellites was equipped with a Wide Field Imager Camera, a Medium Resolution Camera and an Infrared Multispectral Scanner Camera. The spacecraft operated until August 2003. In October 2003, the second CBERS satellite was launched carrying an identical to CBERS 1. 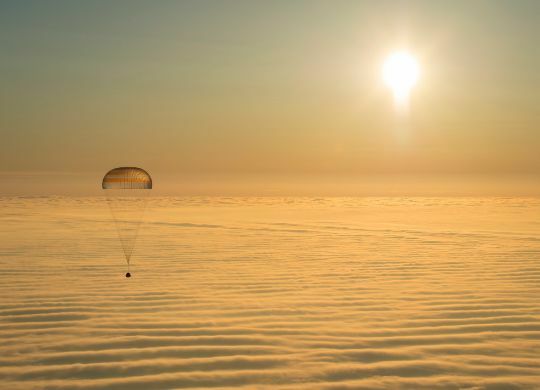 The spacecraft operated as planned and was retired in 2007 when the next satellite was delivered to orbit. 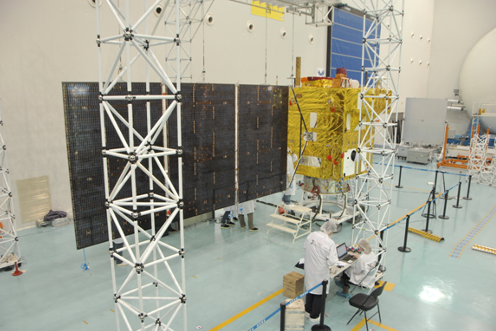 CBERS-2B launched on September 19, 2007 and was similar to the first two spacecraft, continuing the use of the three instruments mentioned above, but expanding the instrument suite by adding a High Resolution Panchromatic Camera. The CBERS-2B satellite suffered an electrical failure in late 2010 and could not be recovered. 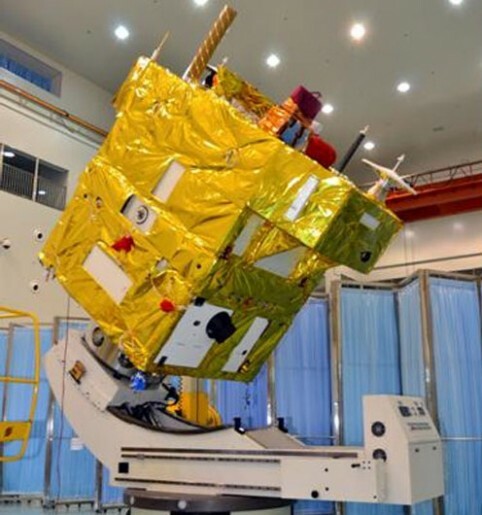 Taking the next step in the CBERS program, China and Brazil initiated the development of a series of advanced instruments to be flown on the CBERS-3 and 4 spacecraft that were planned to be identical, to be launched two years apart to ensure a continued access to data for any users that complete an on-line registration and receive imagery free of charge via the Internet. Four cameras were baselined for the two satellite with significant improvements when compared with the previous CBERS satellites. CBERS-3 launched atop a Long March 4B rocket that lifted off from the Taiyuan Satellite Launch Center at 3:26 UTC on December 9. Late in the ascent mission, the Long March 4B’s upper stage encountered a premature shutdown when it was starved of fuel due to debris entering the engines of the third stage of the launch vehicle- Shutting down 11 seconds too early left the CBERS-3 satellite on a sub-orbital trajectory leading to its re-entry 30 minutes into the flight. 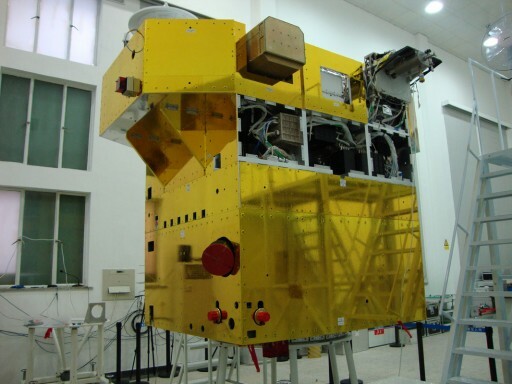 In the wake of the launch failure, China and Brazil agreed to speed up the development of the next satellite to act as replacement for CBERS-3 in order to keep the gap in data as short as possible. The partners agreed to finish the assembly, test and launch processing campaign for CBERS-4 within one year of the CBERS-3 launch failure. The CBERS-4 satellite uses the Phoenix-Eye 1 satellite that was developed by the China Academy of Space Technology and found application in the Chinese Ziyuan Earth observation satellites and likely flew on military missions under the Yaogan program before these missions transitioned to Phoenix Eye 2. The PE-1 bus features a hexahedrical satellite platform consisting of a Service and Payload Module with an overall spacecraft size of 3.35 by 3.35 by 3.25 meters. The CBERS-4 satellite has a launch mass of about 1,980 Kilograms. The spacecraft uses a single power-generating solar array that delivers 2,300 Watts of electrical power using three panels covered with triple-junction gallium-arsenide solar cells. The array can be rotated around the Y-axis of the spacecraft to ensure proper sun tracking for maximum power generation. Power delivered to the satellite is distributed to the various systems using a series of regulators and DC converters; power is stored in Nickel-Cadmium Batteries to be available during night passes. 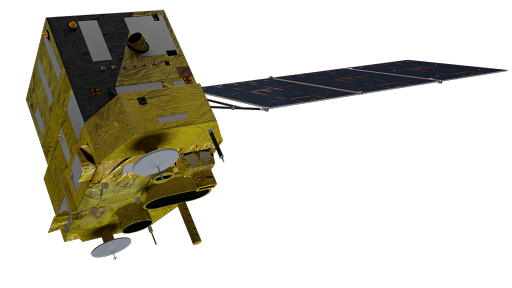 The satellite has precise Earth-pointing capabilities to ensure the instruments mounted on the nadir panel keep pointing straight down to Earth. 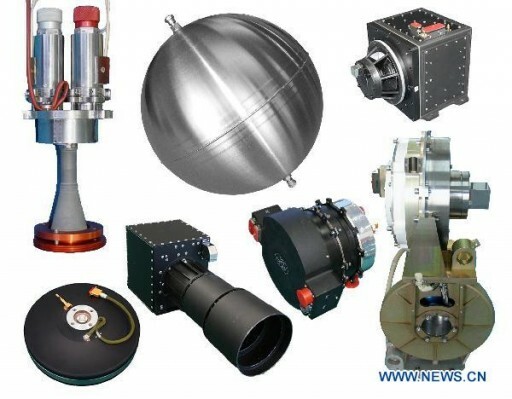 CBERS-4 is equipped with star sensors, sun sensors, three-axis inertial measurement sensors, a GPS receiver and infrared Earth sensors. The star tracker acquires images of star patterns that are used in an internal algorithm that includes several thousand star constellation for an accurate determination of the spacecraft’s three-axis orientation. Each of the Star Trackers has a narrow field of view of 8.5 degrees, a focal length of 7.5 centimeters and an overall mass of 3.7 kilograms including electronics that connect the unit to the spacecraft’s RS-422 data bus. The star trackers acquire one frame per second and require low body rates for acquisition. The sun sensors can be used for coarse attitude control, pointing the solar arrays at the sun to ensure good power-generation. Body rates are measured by the Inertial Reference Unit that delivers data for rate dampening since the star trackers can only acquire star patterns at low body rates. 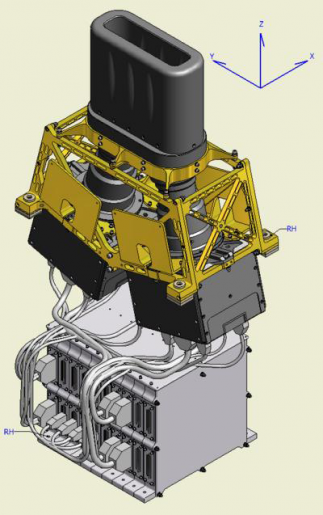 The IR Earth sensor has a mass of 2.8 Kilograms and employs a conical scanning geometry sweeping a 55-degree cone with an instantaneous field of view of 1.5 by 1.5 degrees in order to look for the thermal signature of Earth to provide data on its position relative to the satellite to ensure proper pointing of the instruments. Attitude control is provided by a series of momentum wheels that spin at up to 4000 RPM and represent a rotating mass that is driven by a motor – when accelerating or decelerating the wheel, the satellite body will move into the opposite direction as the result of induced counter torque. The spacecraft uses a hydrazine propulsion and attitude control system that is used for attitude control, orbit adjustments and maintenance as well as desaturation of the vehicle’s momentum wheels. CAST uses 1, 5 and 20 Newton thrusters on its spacecraft. All aspects of the satellite’s mission are controlled by a Central Onboard Computer that interfaces with seven remote terminals that are in charge of commanding the individual systems and deliver telemetry to the onboard computer. The OBC also handles all data from the satellite systems and instruments. An internal 274 Gbit memory is employed to temporarily store payload data before it can be downlinked to the ground via an X-Band Terminal. The communications system features two Traveling Wave Tube Amplifier assemblies, each with three carriers modulated in QPSK (Quadra-Phase Shift Keying). This enables a downlink of the acquired instrument data simultaneously at different frequencies with a total downlink data rate of up to 305 Mbits. The PanMUX imagery is downlinked at 8.208 GHz at a rate of 67Mbit/s while MUXCam Data of a ten-meter resolution is downlinked at 8.108 GHz at 100Mbit/s, Infrared data is downlinked at 8.034 GHz at 17Mbit/s. The second X-Band link is used for MUXCam Data downlinked at 8.365 GHz at a rate of 68Mbit/s, shared with 53Mbit/s of Wide Field Imagery downlinked at 8.290 GHz. Telemetry downlink from the satellite and command and image sequence uplink is accomplished in S-Band at lower data rates. The CBERS-4 satellite hosts four instruments – MUXCam, PanMUX, IRS and WFI as well as a Data Collection System payload and a Space Environment Monitor. CBERS-4 is equipped with an Infrared System based on the Infrared Multispectral Scanner 2 (IRMSS), a scanning instrument that covers four spectral bands, a 0.5 to 0.9-micormeter panchromatic band, a 1.55 to 1.75-micrometer & 2.08 to 2.35-micrometer infrared band & a 10.4 to 12.5-micrometer thermal infrared band. IRMSS acquires images with a ground resolution of 40 meters for the panchromatic and infrared bands and 80 meters for the thermal infrared band. The instrument covers a ground swath of 120 Kilometers providing a full coverage image of Earth every 26 days. The Advanced Wide Field Imager Camera (AWFI) – a pushbroom sensor, also covers four spectral bands: 450 to 520 nanometers (blue), 520 to 590nm (green), 630 to 690nm (red) and 770 to 890nm (near infrared). It has a field of view of 28.6 degrees and a focal length of 150 millimeters. The instrument has a wider ground swath of 866 Kilometers for full Earth coverage in five days. AWFI achieves a ground resolution better than 64 meters. MUXCam, the Multispectral Camera, is a pushbroom-type instrument with a field of view of 4.4 degrees and a focal length of 506 millimeters. The optical system (entrance mirror, a window, a moving lens & 11 fixed lenses) along with the focal plane is facilitated within the 4.7-Kilogram RBNA system while the RBNB system includes thermal control electronics, the focus adjustment mechanism and the instrument calibration system. The RBNC system generates CCD reading clock signals, and includes output processing units and encoding systems that handle the payload data. MUXCam uses a 4-line array detector with 6000 pixels per line being 13 micrometers in size. The instrument covers four spectral bands: 450-520nm (blue), 520-590nm (green), 630-690nm (red) and 770-890nm (near infrared). MUXCam achieves a ground resolution of 20 meters covering a swath of 120 Kilometers. MUX Cam has a nominal revisit time of 26 days. The Data Collection System terminal consists of a UHF antenna to receive messages from Data Collection Platforms deployed in remote locations on Earth. DCPs can be deployed virtually at any location on the globe to provide in-situ measurements of meteorological data that is then uplinked to satellites and transmitted to ground stations for collection, processing and distribution. The DCPs operate in the UHF band at 401/402 MHz. These platforms include remote weather stations, buoys at sea to measure sea state and alert in the event of tsunamis as well as other measurement stations that are deployed in remote locations. Data received via the DCS UHF antenna at data rates of 100 to 300bit/s is relayed to the ground for processing and distribution.